Atmospheric carbon monoxide has been identified as a potential source of energy for microbes – if there are any – on and near the surface of the red planet, in the past as well as the present, according to a new study. Theresearch, published in the Proceedings of the National Academy of Sciences (PNAS) on Monday, suggests that carbon monoxide which is found in “relatively high concentrations” in Mars’ atmosphere could serve as a “significant source of energy” for microbes on the planet. "Of course, it must be noted that the persistence of extant microbial populations, if any exist, or populations transplanted in the future, depends on factors other than energy substrates," the paper also notes. Though microbes may potentially flourish under the planet’s polar caps or even in brine puddles – ultra-salty water – locked under Mars’s soils, it had not previously been clear what they may have consumed for energy. Gary King, the author of the study and a biologist at Louisiana State University, suggests for the first time that carbon monoxide could be the mysterious energy source. King took soil samples from three places on earth with extremely dry climates and salty soil and determined that the soil pulled out and retained carbon monoxide out of the air. In the study, he suggests that the same process could occur on Mars, whose atmosphere has more carbon monoxide than the Earth’s. 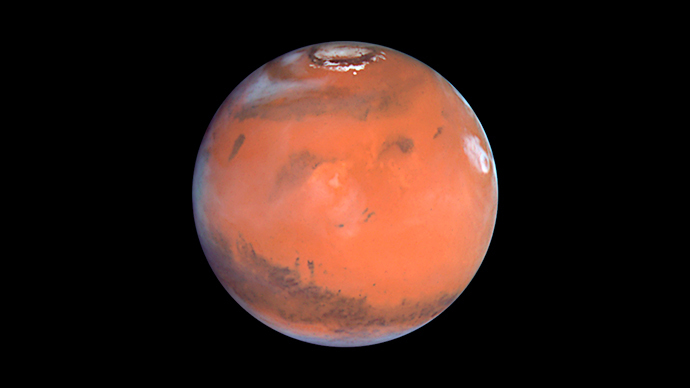 However, King’s claims are presently impossible to verify as Mars rovers are not equipped with the necessary technology. "This is a very important piece of work for Mars astrobiology," Chris McKay, an astrobiologist at NASA who was not involved in the PNAS study, told Popular Mechanics. "What this research means is that we now know of an energy source for microbial systems that could exist anywhere near the surface of Mars." PNAS published another Mars-related study on Tuesday which claimed that NASA’s Curiosity rover had found nitrogen on Mars, suggesting the possibility that Mars could have supported an ancient nitrogen cycle. "Life runs on nitrogen as much as it runs on carbon,” NASA geochemist and team member Jennifer Stern told the LA Times.